Researchers using satellite imaging have found much greater than expected deforestation since 2000 in the highlands of Southeast Asia, a critically important world ecosystem. Zhenzhong Zeng, a postdoctoral researcher at Princeton University and the lead author of a July 2 article describing the findings in Nature Geoscience, said the researchers used a combination of satellite data and computational algorithms to reach their conclusions. The report shows a loss of 29.3 million hectares of forest (roughly 113,000 square miles or about twice the size of New York state) between 2000 and 2014. Zeng said that represents 57 percent more loss than current estimations of deforestation made by the International Panel on Climate Change. He said most of the forest has been cleared for crops. Because forests absorb atmospheric carbon, and burning forests contribute carbon to the atmosphere, loss of forests could be devastating. An accurate estimation of forest cover also is critical for assessments of climate change. 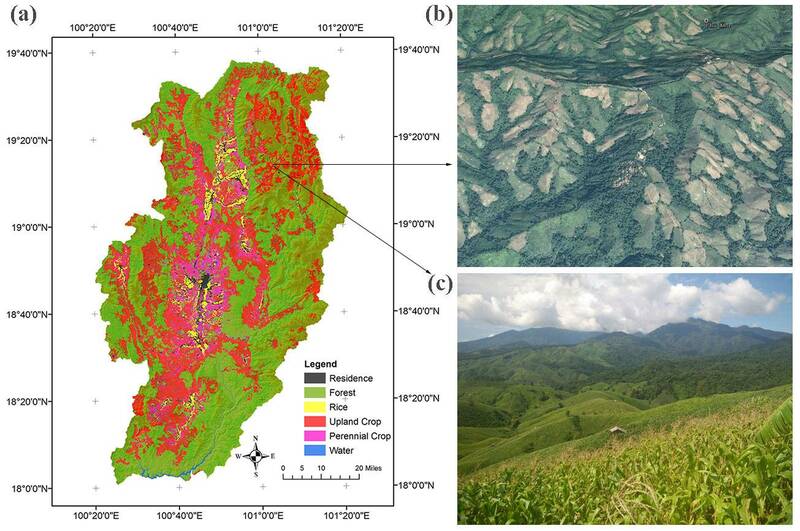 Zeng also said transformation of mountainous regions from old forest to cropland can have widespread environmental impacts from soil retention to water quality in the region. UPM and the Forest Stewardship Council® (FSC) announce a global strategic partnership to develop solutions for advancing the uptake of FSC in the market. UPM and FSC signed the partnership agreement on the 16th of May 2017 during the FSC international members meeting in Karkkila, Finland. The partnership aims at delivering benefits to forest owners through FSC certification and to increase the FSC-certified wood supply. UPM has actively cooperated with FSC both on international and national level for several years. The company has been involved in developing the FSC certification in order to enhance its applicability to the fragmented private forest ownership in Finland. This work will be strengthened through the newly agreed partnership. The fifth Mediterranean Forest Week and the 19th Commonwealth Forestry Conference (CFC) brought together countries and other stakeholders to share experiences, promote sustainable forest management and encourage action in support of forest-related development goals and priorities. The fifth Mediterranean Forest Week, held from 20-24 March 2017, in Agadir, Morocco, coincided with the International Day of Forests, held annually on 21 March. The Week focused on the restoration of Mediterranean forests and landscapes, and resulted in nine countries affirming their support to forest and landscape restoration (FLR), land degradation neutrality (LDN) and biodiversity conservation efforts in the Mediterranean region. Algeria, France, Iran, Lebanon, Morocco, Portugal, Spain, Tunisia and Turkey committed to a “new regional dynamic.” The dynamic is meant to boost achievement of the Bonn Challenge (to restore 150 million hectares of the world’s deforested and degraded land by 2020 and 350 million hectares by 2030) and the targets laid out in Sustainable Development Goal (SDG) 15 (life on land), as well as the UN Forum for Forests (UNFF) Strategic Plan for Forests 2017-2030. It will also seek to catalyze regional forest and landscape restoration goals linked to the broader sustainable development agenda. The 19th CFC convened at the Forest Research Institute in Dehradun, India, from 3-7 April 2017, under the theme ‘Forests for Prosperity and Posterity.’ The Conference served as a platform for CFC participants to share experiences, strengthen forest research, identify critical issues and support the collaborative management of forests as they relate to water, food and energy security with an overarching goal of contributing to SDG implementation. The combined export value of wood pellets, ethanol and biodiesel for U.S. producers has flirted with $3 billion since 2012, and depending upon how the final numbers shake out for last year, 2016 may very well be the year this milestone is surpassed. For both wood pellets and fuel ethanol, export numbers have never been higher than they are right now, and all three sectors are eyeing foreign markets as a means to significantly grow their businesses. An analysis of the same data reveals key and informative differences. While foreign markets are an important part of the overall market picture for fuel ethanol and biodiesel producers, exports account for less than 10 percent of annual production while, from a volumetric perspective, wood pellet production in the U.S. is heavily reliant on foreign markets. Now, the looming question is, what impact will a Trump administration, which campaigned on a promise to revisit the nation’s trade agreements, have on the export opportunities for each of these industries? In both the fuel ethanol and wood pellet categories, the U.S. can boast the largest production capacity and the largest share of the global export market. In both cases, U.S. exports outstrip the closest competitor by a wide margin. Wood pellet export volumes for U.S. producers were well over 4 million tons, while Canada has yet to surpass 2 million tons of exports. Brazil is the world’s second leading producer of fuel ethanol, and while production and export volumes there vary from year to year, in 2015, its export volumes were about half of what U.S. producers achieved. Additionally, Brazil is a prominent market for U.S. ethanol producers taking over 100 million gallons in 2015. Tropical reforestation is an important part of the global effort to mitigate climate change, but ecologist Karen Holl says current international goals may be overly ambitious. For decades, tropical forests around the world have been cleared to make way for agricultural and wood products, leaving a wake of environmental devastation behind. Tropical deforestation is a significant contributor to climate change, generating 12-15 percent of global carbon emissions. To turn that around, the international environmental community has embraced ambitious forest restoration goals: Thirty countries have signed on to restore areas equivalent to the size of Venezuela by 2020; participants at the 2014 United Nations Climate Summit set a global target of nearly four times that by 2030. Given the current scale of scientific research, those goals may be unattainable, warns Holl, who advises nongovernmental organizations (NGOs) and policy makers around the world and recently authored a “Perspectives” column in Science magazine on this topic. Most scientific studies are done on relatively small plots—typically a few acres—and results are literally rooted in local conditions, making them difficult to scale up to anywhere near the scope of international agreements. Restoring vast amounts of forest will require major shifts in planning and science, says Holl. 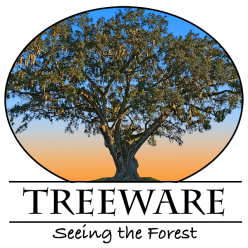 The industrial wood pellet industry is catching its breath after an astounding surge since the turn of the millennium. Global production of pellets totaled roughly 2 million metric tons (MT) in 2001, and roughly 28 million MT in 2015. 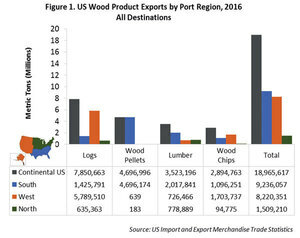 As this market continues to evolve globally, it’s a good time to step back and analyze other U.S. forest product exports by region and type. This data can tell us a lot about raw material utilization, and help uncover new opportunities for biomass and wood pellet growth in foreign markets. New demand for industrial wood pellets is on the horizon, as directives from the Paris climate agreement begin to take effect, and Asian markets—particularly the South Korean and Japanese markets—represent new opportunities for U.S. producers. Global softwood lumber trade increased 12 percent year-over-year to reach a new record-high of 121 million m3 in 2016, per estimates by WRI. Since the global financial recession in 2009, there has been a steady climb in international trade of lumber, with shipments the past seven years having increased as much as 66 percent. Since the global financial recession in 2009, there has been a steady climb in international trade of lumber, with shipments the past seven years having increased as much as 66 percent. While it is no surprise that China is a major driver for the dramatic rise in lumber shipments worldwide the past seven years, it is interesting to note that the US has actually increased softwood lumber imports more than China. Lawmakers have called for a ban on the “mining” of an ancient New Zealand timber resource after a government report Monday showed that half of it might have already disappeared. The report showed that an estimated 30 percent to 50 percent of swamp kauri logs – massive logs of New Zealand’s native kauri hardwood that have been preserved in peat land for thousands of years – have been removed from the ground. It was one of three reports on swamp kauri, which is found in the far northern Northland region, published by the Ministry for Primary Industries (MPI) on Monday. The reports provided information on the scientific and cultural values of swamp kauri and its distribution and remaining volume. “This is the first time an attempt has been made to assess the swamp kauri resource,” MPI director general of regulation and assurance Bryan Wilson said in a statement. The reports also said that swamp kauri held significant value for New Zealanders, due to its age, appearance, and its cultural properties. “They also highlight swamp kauri’s scientific value in helping to understand the natural history of New Zealand, and its contribution to understanding the effects of climate change,” said Wilson. a combination of political instability, government mismanagement, a lack of forest operation controls and a failure to impose punitive penalties on well-known traffickers contributed to what was effectively zero control over the management of precious timber resources in Madagascar between March 2010 to March 2015, according to a new TRAFFIC study released today. At least 350,000 trees were illegally felled inside protected areas and at least 150,000 tonnes of logs illegally exported to destinations including China, Malaysia and Mauritius over the five-year period, according to the study: Timber Island: The Rosewood and Ebony Trade of Madagascar. The lack of regulation was compounded by additional factors including widespread poverty, corruption, poor species identification skills at point of harvest and deficient knowledge about timber resources and led to rampant, unregulated felling of precious timber species.